Samsung, one of the industry's juggernauts, has released their line of LCD monitors into the public for all to gaze upon. If you take a moment and really think about what I just said, it's quite amazing how far things have come. Let's take a little jump back in time to the year 1969 when a little company with a big vision opened it's doors for business. Samsung was its name and electronics were their game. Two short years after they opened, they started to ship out their first black-and-white television. Who would have thought 31 years later they would be making liquid crystal display (LCD) monitors and televisions. We at SLCentral are happy they didn't stop at black-and-white, and are extremely excited to get our hands on one of their works-of-art. 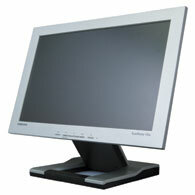 Equipped with its many features, such as its 17inch viewable area, dual hinge system and DVI input, this monitor looks great on it's spec sheet and we haven't even turned it on yet! Lets begin this review shall we?